This AmazonBasics Ultra Thin 25-mile indoor TV antenna is only $7.78 on Amazon. 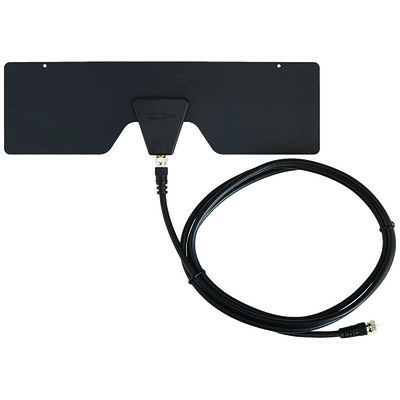 This antenna normally sells for around $13, and even though we’ve seen it drop to around $9 or so before, drops lower than $8 have been very rare. Because of the limited range on this antenna, this is not going to serve you well in a rural place. You’ll get a lot more out of it if you live in a downtown, urban environment. Use this handy website to figure out how well it’ll work for you. This antenna lets you pick up channels like ABC, NBC, PBS, Fox, and more. It supports up to 1080p HD resolutions. It has black and white sides, and it can be painted over if you would like it to be a different color. The coaxial cable is six feet long. This antenna has 3.5 stars based on more than 2,600 reviews.